Our second to last port for SAS is Ecuador. During this port I realized how much I’ve been able to step out of my comfort zone not only in Ecuador but throughout the voyage. 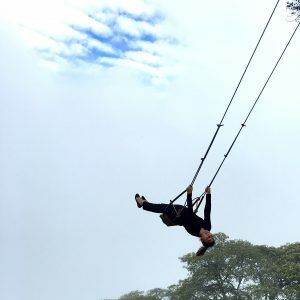 In Ecuador I signed up for a field program called Adventure in the Andes. We traveled to a city called Baños which is the gateway to the Amazon and the last big city located before entering the Amazon. It is an absolutely amazing beautiful city full of waterfalls and offers a lot of adventurous activities. which is anchored on a skinny tree branch of a treehouse and its purpose is to overlook Mt.Tungurahua. The swing dangles your feet off the very edge of the mountain and you feel as if your swinging in the clouds. As I was about to get off of the swing, I almost fell off the cliff. I literally saw my life flash before my eyes before I was able to stable and balance myself on the cliff. After this, we put on our wet suit and headed to the Pastaza River for Class III White Water rafting. 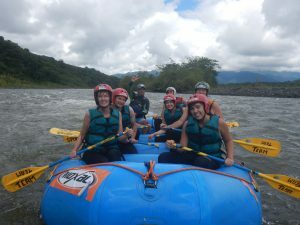 I’ve never been rafting before so I didn’t know what to expect. At first I was put in the back of the raft, and everyone thought that because I was so light I would easily fall off of the raft. We switched seats throughout the 2hour raft, and for the last hour I became team leader for the left side and sat in the front. Being in the front, you get the most wet and catch most of the waves. At least 3 huge waves went over my head and I remained on the raft the whole time. After rafting, we went Canyoning down 5 waterfalls. The first two waterfalls we canyoned down, where we used a rope to repel ourselves down. It was very challenging and I think I made it harder on myself because I was afraid to lean back (which makes it easier) and I was afraid of losing grip on the waterfall rocks. On the third waterfall we ziplined down. This was one of the most thrilling moments. I was so scared to let go. By the fourth waterfall (the largest waterfall) I was terrified to canyon again down but I kept taking heavy breaths. Sarcastically I told my friend it was as if I felt the end of my life was near. Once it was my turn, I took a deep breath, leaned back and focused on getting down without looking down. To my surprise, although this was the tallest waterfall it was the easiest for me because I got use to the technique and remained calm. I had the biggest smile on my face as I took my last steps on the bottom of the fourth waterfall because I was so proud of myself. For our last waterfall, it was very much like a waterslide as we slid down the waterfall. The most fun waterfall was saved for last. Almost the whole time during the canyoning, I kept asking myself “Why did I sign up for this?” I’ve never been athletic nor adventurous; I usually stick to what I know and don’t go out of my comfort zone. When I told my family and my boyfriend I signed up for this program they were shocked. My boyfriend told me he didn’t think I could do it because I didn’t have enough body strength. Hearing these things made me realize how I’ve learned on this trip not to let what other people say to me affect me. I’ve learned how to ignore negative energy and to make sure that no one tells me what I can or can’t do. At the end of the day it is me who makes the decisions and its me who can make myself stronger or open myself out of my comfort zone. I’m so proud of all of the adventurous things I’ve done that I wouldn’t necessarily sign up for before SAS. Now I look forward to taking risks and stepping out of my comfort zone in new adventures. I wouldn’t be able to learn this without being a part of SAS.